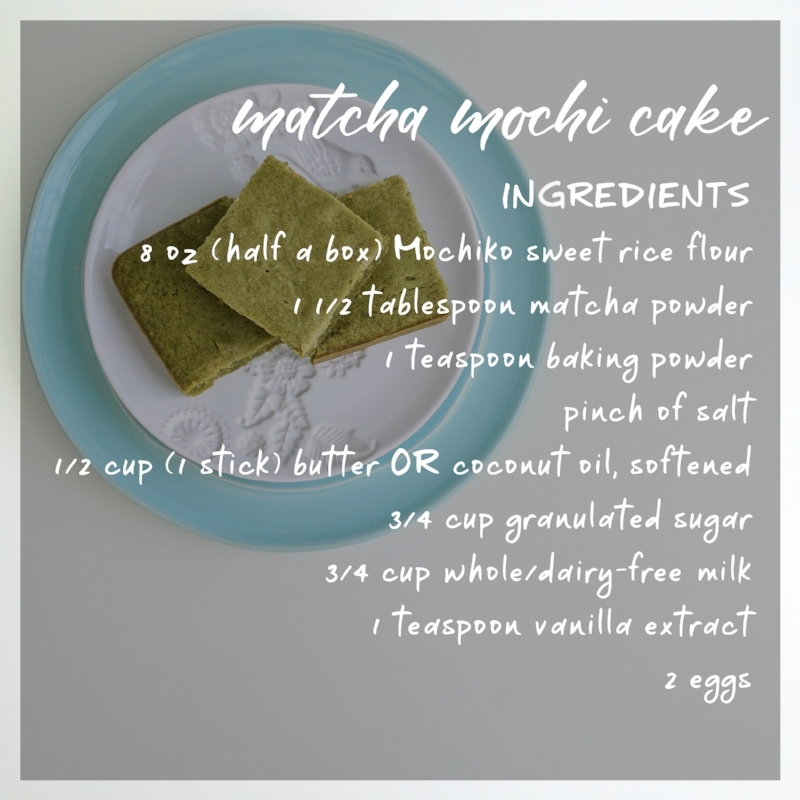 Recipe: Matcha Mochi Cake — Lillian Liming Design Co. If you know me, (or have followed along on either of my Instagram accounts, then you know I'm a bit obsessed with matcha. At first, it was just matcha-infused sweets because I found matcha as a beverage by itself too bitter for me. That was until I recently discovered cold brew matcha. Turns out, I had been brewing matcha incorrectly all these years - using water that was boiling hot, thus burning the delicate tea powder and creating that bitter flavor. I could go on and on about how to properly brew/prepare matcha but I'll direct you to the experts so we can talk about this matcha mochi cake. Since I live 45 minutes outside of NYC (by train), matcha desserts are hard to come by. My sweet tooth has been hankering for one of these amazing matcha treats and as much as I'd love to - I can't justify spending that time and money trekking into the city just for matcha desserts. I'm obsessed but not that obsessed. So, I remedied the situation by baking my own treat - a lightly sweet, and chewy matcha mochi cake. I've made this cake many times before - back in my food blogging days when I had much more patience for baking. But, this time I made it dairy-free as I've been trying to avoid milk due to my lactose intolerance (boo...). I substituted coconut oil for the butter - Trader Joe's now has a triple filtered version that has no coconut flavor at all. But if you enjoy the flavor/aroma of coconut, feel free to use it! And instead of whole milk, I used cashew milk (I've been loving the cashew milk by Forager Project lately). If you can tolerate dairy, I recommend making the original version first. I wasn't sure how the cake would bake/taste using these substitutions but I was pleasantly surprised with the results! Obviously, the cake isn't as fragrant and rich as the dairy-filled version but it was still satisfying. My favorite part are the chewy edges. If I were to bake it again, I would up the matcha powder to two tablespoons or use a higher quality for a stronger matcha flavor. Let me know if you decide to try this recipe - I'd love to know what you think! PS. Yes, I did create the lettering for these images - actually, they are my handwriting and lettering turned into fonts. Makes life so much easier. ;) Click on each image to enlarge or pin them for later! Matcha powder and Mochiko rice flour can usually be found at an Asian grocery store or ordered online. The original recipe makes double the amount of this recipe and is baked in a 9x13 inch pan for 60 minutes so if you're feeding a larger crowd feel free to double this recipe. Preheat oven to 350 degrees F. Grease an 8x8-inch pan with butter. In a medium bowl, whisk together rice flour, baking powder, salt and matcha powder. Set aside. In another bowl, beat the butter/coconut oil and sugar with a mixer or whisk until creamy. Stir in milk and vanilla, then add eggs. Gradually add the rice flour mixture and mix until well-combined. Spread batter evenly into prepared ban. Bake for 30-35 minutes, or until a toothpick inserted into the center of cake comes out clean. The cake will brown around the edges and pull away from the sides of the pan. Let cool completely before cutting into squares.